The Angriest: Star Trek: Voyager: "Basics, Part I"
Star Trek: Voyager: "Basics, Part I"
It is 20 May 1996, and time for the Season 2 finale of Star Trek: Voyager. Chakotay (Robert Beltran) receives an emergency transmission from ex-lover and traitor Seska (Martha Hackett): she is about to give birth to their child, her new lover Cullah (Anthony De Longis) has discovered the baby is not his, and she fears for his life. Despite suspecting the entire message is a trap, Captain Janeway (Kate Mulgrew) leads Voyager on an urgent rescue mission. 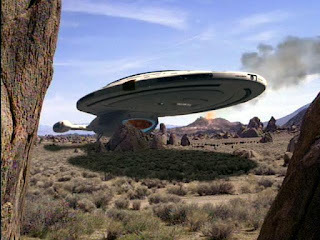 Star Trek history time: "Basics, Part I" is the final episode of Star Trek to be written by Michael Piller. Brought it as a writer and then as an executive producer on Star Trek: The Next Generation, it was Piller who aggressively shifted the series' narratives from a science fiction/action focus to one on characters and relationships. His effect on the franchise cannot be understated: not only did he effectively create 1990s Star Trek, he went on to co-develop both Deep Space Nine and Voyager. On the way he contributed some of the franchise's best-ever episodes, including "The Best of Both Worlds". I had "The Best of Both Worlds" in mind when watching "Basics", since the new episode serves an identical purpose to the old one. Back in 1990 Piller wrote a jaw-dropping cliffhanger - Picard transformed into a Borg - which kept fans and viewers clamouring for the follow-up later in the year. It felt like the must-see television event of its year, and there's a laudable effort to deliver a similarly bold cliffhanger here. It is a trap, of course, and a successful one: Maje Culluh and the Kazon Nistrim wear down Voyager's defences, invade the ship, and assume control. Captain Janeway and her entire crew are left stranded on an alien planet as Voyager flies away without them - an alive-and-well Seska and Chakotay's infant son onboard. It's a solid and entertaining episode, but stumbles a little in comparison to "Best of Both Worlds". That episode had such an impact because a resolution seemed unimaginable at the time. Here the resolution is clearly signposted: Lt Paris (Robert Duncan McNeill) is reported dead in a shuttle explosion, but we neither see the explosion nor a body, so it is safe to assume he's still out there. Furthermore, not everyone on Voyager got off the ship: the Doctor (Robert Picardo) is hard-wired to the ship, while the serial killer Lon Suder (Brad Dourif) is still on board, in hiding, and out of captivity for the first time since his killing spree. Perhaps it isn't such a bad thing, of course: while "The Best of Both Worlds" made for a great cliffhanger, its resolution was stuck writing an exciting follow-up out of an impossible problem. This time around Piller packages the solution with the question, guaranteeing that a disappointing second half won't be so likely. It's nice to see so many of the season's story threads culminate here: the Kazon arc, Chakotay and Seska's baby, and the return of Suder after "Meld". It feels appropriately climactic and serious. This is the 16th good episode of Season 2 out of 26. That gives this season a final quality ratio of 62 per cent; a big step up from Season 1's 47 per cent. Star Trek: Deep Space Nine: "Apocalypse Rising"
Star Trek: Voyager: "The Thaw"